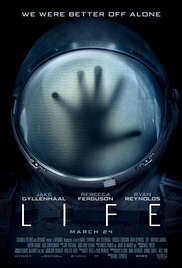 Life is a movie about astronauts who collect and study a sample from Mars, discovering there is life beyond earth. The question they are trying to uncover is if it's friendly or not to figure out what happened to other life on Mars. I love sci-fi movies and when flicks include space I am hooked. Life reminded me a little of the movie 'Alien' and although we don't see any xenomorphs, we get a new scary creature that must be stopped or killed in space so it doesn't reach Earth. This was a thrill of survival between the new life form and the humans. The cast and story were on par but Life was predictable. That was the only negative thing that bothered me. This was a good horror movie in space and if you want to be scared to ever go up, then I would not suggest seeing this because no one can hear you scream up there.